This September, celebrate the 200th anniversary of the bicycle with one of the most challenging bike races in the world. The 2017 Kingdom of Bhutan’s annual Tour of the Dragon starts in Bumthang (Saturday, September 2nd, 2017, 2:00 AM,), travels 268 km over four mountain passes and ends in the Thimphu town square. It is considered one of the toughest one-day mountain bike races in the world covering some extremely challenging and incredibly scenic roads. With Bhutan’s breathtakingly beautiful high mountains, deep mystic valleys and pristine forests as the backdrop, this event is truly a biker’s paradise. In honor of this event, Gangtey Lodge has put together an exclusive package for guests competing in the race who are looking for last minute training and important body preparation. The luxury property will provide meticulously thought out meals, challenging practice runs and targeted spa treatments to prepare you for the big day. Please find more details of this unique package below and a link to the itinerary here. Rates: USD 2,400++ for 4 nights double occupancy. 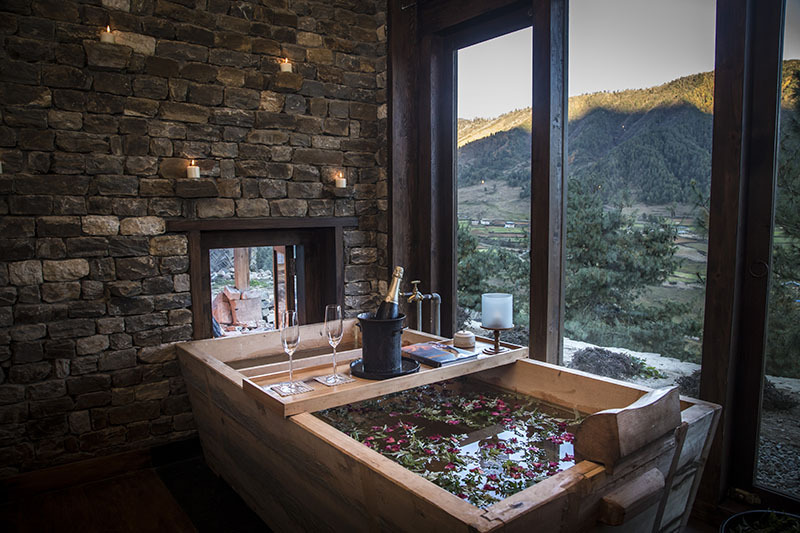 The multi award winning Gangtey Lodge in the Kingdom of Bhutan delivers a genuine and authentic experience in one of the world’s most undiscovered destinations. With only twelve guestrooms, complete with cosy fireplaces and underfloor heating, Gangtey Lodge is an exclusive and peaceful sanctuary. The hub of the lodge is its lounge and dining space, with plush leather sofas, two stone fireplaces, and wall to ceiling windows offering views of the misty valley below. Guests gather around the long tables and dine on organically sourced Bhutanese dishes such as ema datshi, a chilli-and-yak-cheese stew. Home-style Western and Asian cuisine options are also available and wherever possible, the chefs use local and organic produce. The area is steeped in history and guests are invited to join in with a range of traditional activities, such as attending the Morning Prayer service at the Shedra (monk school), visiting one of the valley’s oldest farm houses, and learning Dha or Archery – Bhutan’s national game. Follow hiking and mountain biking trails through the Gangtey Valley, or visit the temple of Kumbu Lhakang in a nearby village. Unwind with some evening meditation at Gangtey Lodge Spa followed by a traditional hot stone bath in a wooden tub, filled with water from the stream which is heated over an open fire.